The bathroom of your house should be a haven of tranquillity that you escape to when everything else seems to be out of control. Decorating it in a way that echoes this sentiment won’t just make you feel more relaxed in your everyday life, it also adds value to your home. 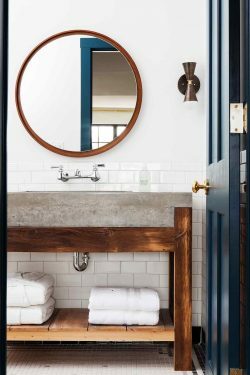 While you certainly don’t have to change the style of your bathroom to constantly keep up with what’s on trend, you can try to incorporate a few of these trends for 2018. They might be in vogue now, but their universal appeal means that they’re likely to be popular for quite some time to come. Freestanding bathtubs have been all the rage for quite a while, but the trend is catching on almost everywhere in 2018. Nothing spells relaxation quite like a freestanding tub, filled to the brim with bubbles. 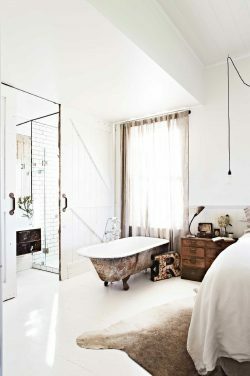 The style of tub depends on what you like, but it can be rustic, like the tub pictured below, or it can have a more modern edge. Brass taps and fixtures recall the glory of times gone by. This retro trend is replacing the clean and shiny chrome of the past few years. 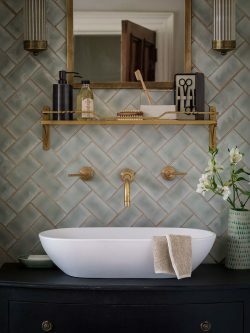 Brass can be combined with a variety of colour palettes, which makes it a practical choice, too. A few years ago, raw concrete was quite popular all over the home. The new trend is a variety of shades of concrete that still take advantage of the clean ruggedness that this material offers. Use it for everything from tubs, to basins and showers. This is a DIY project waiting to happen! 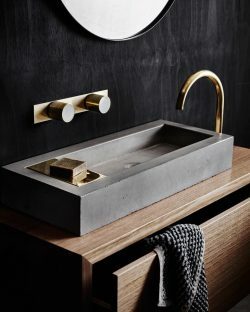 Another popular trend that is coming into its own is a shift towards freestanding basins. 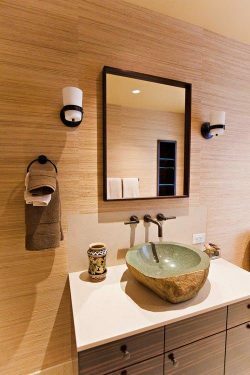 What makes this trend great is that you can choose a style of basin that suits the rest of your bathroom. Have a look at this interesting freestanding basin that has been carved out of rock. Raw and organic materials are more popular than ever, and a combination of raw materials like wood and concrete makes a statement that ceramics just can’t equal. Source: Jersey Ice Cream Co.